Protecting documents when moving between classrooms or boardrooms can be difficult, but not impossible. The Zippered Binder with Expanding File not only protects 8-1/2 x 11 size documents during transport, but it also keeps paperwork organized. Featuring a three-ring binder, seven pocket expanding file and zippered pouch, this versatile file has the ability to store a variety of things in many different ways. 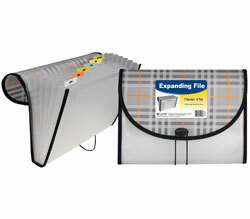 Use the ring binder to freely store letter-size documents that are hole punched or placed inside a sheet protector. Featuring seven pockets and six dividers, use the pre-printed tab inserts to identify where pages are stored inside the expanding file. The mesh pencil pouch is the perfect location to store small objects such as pens, pencils, paper clips and more. For added security, the entire file is protected with a zipper closure that has the ability to contain all items inside. Blue. 1/EA.